Avenida Baleares, 2, 46023 Valencia, Spanje. Beatriz Rey Don Jaime Hotel, located in a privileged site and it is the best choice for those who visit Valencia searching for culture, beaches, leisure or business. 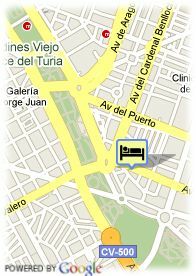 The hotel is in the heart of the city, whithin a walking distance of the 'Oceanográfico, 'City of the Arts and Science and just besides the beautiful Turia Gardens and 'Palau de la Música'. 'El Saler' and 'Parque Natural de la Albufera' are 20 km away. It offers 319 rooms well equipped with full equipped bathroom with hair dryer, air conditioning, satellite television, minibar, safe, trouser press. If offers also breakfast and room service, laundry service, 24 hour room service. Beatriz Rey Don Jaime Hotel was designed to attend any business request, from a congress to a convention or formative courses. 10 meeting rooms totally equipped with a capacity of 280 people. Strand, Centrum, dichtbij musea, dichtbij/in de historische binnenstad, dichtbij winkelcentra. Voor oudere kinderen en volwassenen wordt 36.38 € per extra bed aangerekend. Hotel Vora Fira Valencia is gelegen tegenover het expositiecentrum, 5 min van de luchthaven en het centrum.